When the harsh winter of 1830 followed a poor harvest and caused reduced wages for labourers, agricultural riots spread across Norfolk and throughout the south and east of England. The labourers wanted to stop the spread of new threshing machines, which they viewed as a threat to one of their few winter employments. demanding wage rises, reduced tithes or destruction of threshing machines. 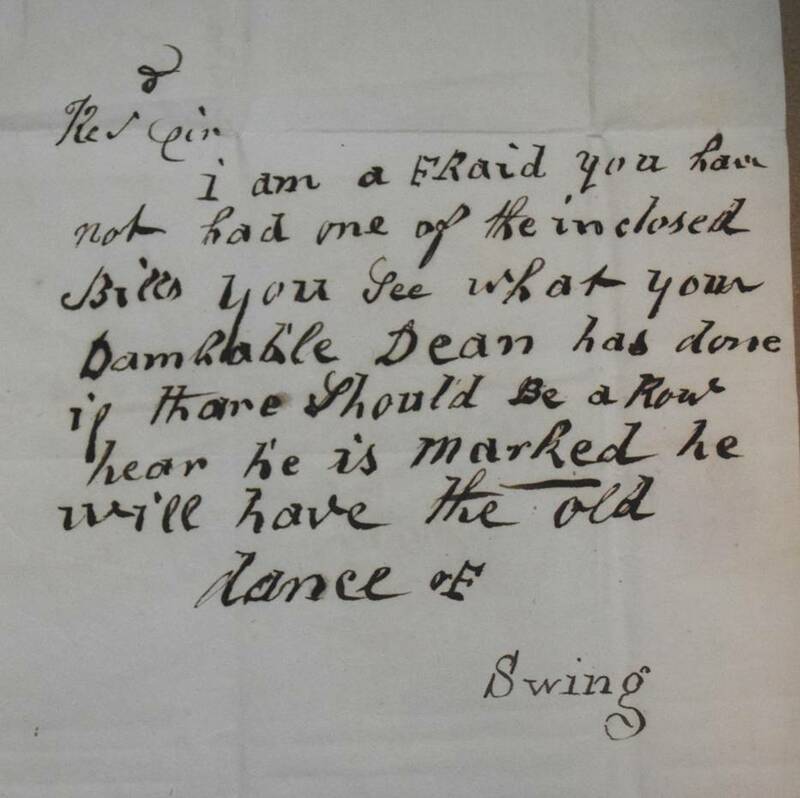 One of these letters, now held at the Norfolk Record Office, was sent to the Dean of Norwich Cathedral in October 1831; the cathedral owned a lot of land in Norfolk at this time. If demands were not met, the letter threatened, crowds of labourers would gather, burning hayricks and smashing agricultural machinery. Some farmers, who agreed with the labourers’ tithe protests, and some magistrates, who wanted to keep the peace locally, were lenient towards the rioters. In November 1830, magistrates at North Walsham recommended that landowners discontinue using threshing machines and raise wages to 10 shillings a week. However, the Home Secretary, Lord Melbourne, who feared the work of political agents (the revolution of July 1830 in France had recently broken out) dealt with the rioters more harshly. Nationally, nine were hanged and 450 were transported to Australia. According to local newspaper reports, the riots in Norfolk began on 10 November, when threshing machines were broken and stacks were fired at the farm of J. Hill in Briston. On 22 November, it was feared that an attack would be made on Melton Constable Hall, home of Sir Jacob Astley, but local gentlemen met the rioters at Hindolveston, seized the ringleaders and took them to Walsingham Bridewell. When the High Sheriff (the Hon. G.J. Miles) feared further attack, he sent a messenger to Elmham Park, where the gentlemen of the Norfolk Hunt were meeting that day. The horsemen arrived at Melton Constable and helped to disperse the angry crowd. The First Royal Dragoons were also sent from Norwich to put down riots in disturbed areas. According to Mackie’s Norfolk Annals, in January 1831, lists of Norfolk Quarter Sessions prisoners contained the names of 108 people indicted for machine-breaking riots. Trials took place before Serjeant William Frere, Lord Suffield and Sir John Boileau, magistrates, at the Shirehall in Norwich. Of the rioters, 67 were found guilty of machine-breaking and 41 were acquitted. Nine were sentenced to transportation, including George Howes of Cawston who was transported for 14 years for his part in several local riots; the remainder received prison sentences ranging from two to three years to 14 days. This entry was posted in Snapshots from the Archive and tagged agriculture, crime, economics, employment, farmers, labourers, magistrates, punishment, riots, swing. Bookmark the permalink.